Nov. 25 2015, ©. Leeham Co: Bombardier (BBD) has not had an easy year. The stock plunged from just over $4 at the beginning of the year to a low of just over $1 today on the continuing of a cash crisis and what to do with the CSeries program. We tend to agree with him and it was a leadership that described a plausible roadmap to a future. Bombardier could before the event relegate the question of the company’s immediate survival to the past, thanks to La Caisse de dépôt et placement du Québec (CDPQ) taking a 30% stake in the BBD Train unit. This will inject US$1.5bn to the company cash in addition to the $1bn that the Province of Quebec previously agreed to inject in the CSeries program. Both investments are scheduled to close in the first quarter. The conference could therefore be focused on a presentation on how to transform the company for 6% annual compound growth and acceptable profitability in all its business units until 2020. 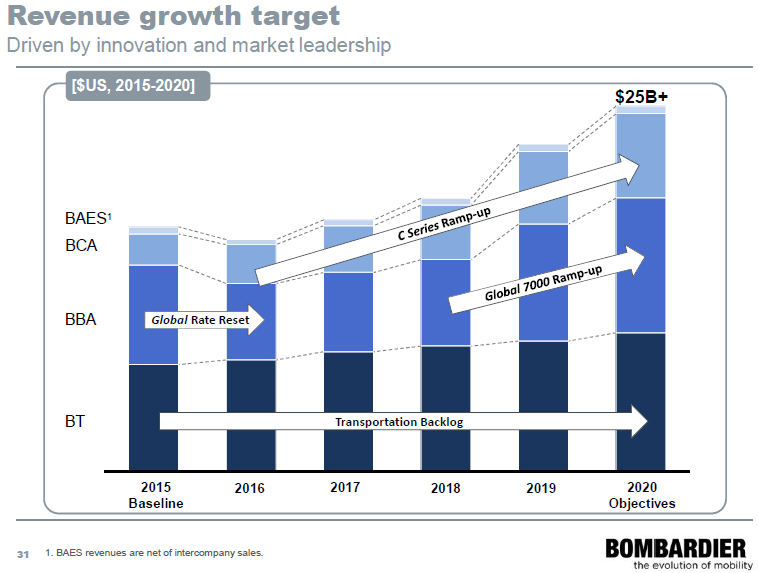 Bombardier is today a company composed of two dominating profitable business units, Business Aircraft (BBA) and Transporation (trains) (BT), figure 1. Figure 1. Revenue and planned revenue growth of BBD. Source: All figures BBD. These are flanked by a smaller, non-profitable, Commercial Airplane unit (BCA) and an Aerostructures unit (BAES) with mostly internal customers. Of the divisions, the Transportation unit has a steady development with a ~5% EBIT growing to a planned 8% by 2020. The Business Aircraft unit has best-in-class products in most segments, Figure 2, but it has seen hardened competition recently for its Global 5000/6000 large business jets from Gulfstream and Dassault. 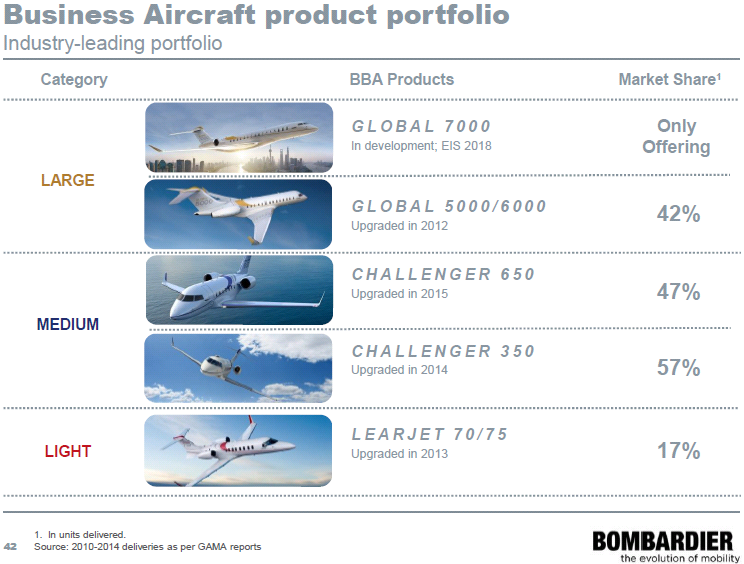 Figure 2. Business Aircraft product line-up and market shares. The unit has therefore lowered production of the profitable Global 5000/6000 during 2015 as Book-to-Bill for the product line was below 0.5. The unit plans to grown from 2018 when deliveries of its super large and long range (7,300nm) Global 7000 start deliveries. Seen in the picture of Bombardier as a whole, one can ask why betting the company on the CSeries program? The Commercial Aircraft unit is the smallest and definitely not the most profitable. First of all, CA and BBA share technologies. The Fly-By-Wire developed for CSeries (and which caused most of the delays) will also be used for Global 7000/8000. 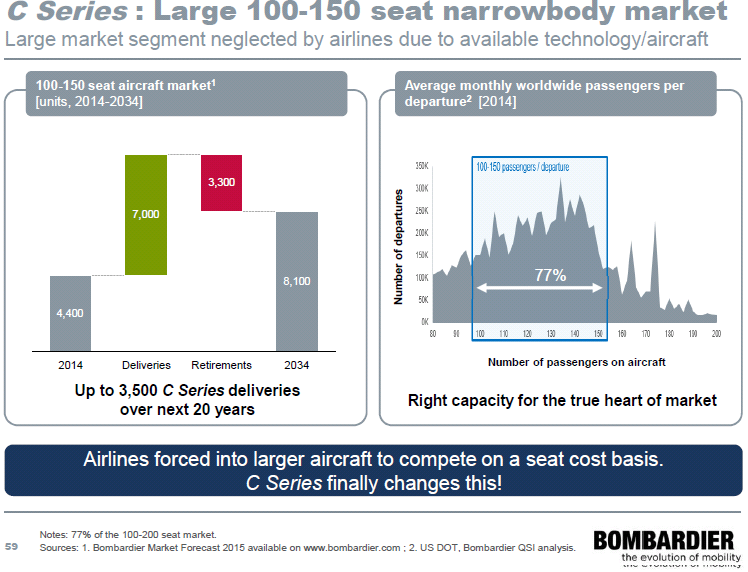 Secondly, the CSeries has a market potential to propel BBD to a leader in its commercial aircraft segment, 100 to 150 seats, Figure 3. Figure 3. The 100 to 150 seat narrowbody market according to Bombardier. It will be the only clean sheet aircraft in this market with the updated Embraer E-jet E2 as main competition. The E-Jet does not cover the whole segment, stopping short at 135 seats. The Boeing 737 MAX 7 and Airbus A319neo cover the 135 to 150 seat segment but these models are not selling well. The 737 MAX and A320neo product lines are optimized for the larger 150 to 200 seat segment. BBD aims for a 50% market share in an accessible market of 7,000 aircraft minus the 500 units of competitor aircraft already sold in the segment. It therefore sees a market for 3,300 CSeries aircraft. BBD therefore sees a clear chance to over time have three equally large business segments, each with market-leading products in their respective business segments. We will now focus the Commercial Aircraft segment and its plans to revenue growth and profit. CSeries has finished flight tests and is now conducting route proving with the first serial production aircraft. The CA president, Fred Cromer, said that the business unit has an order backlog which cover most of a transformation to profitability for the CSeries. The sales team is concentrating to bring on board further mainline airline customers like Swiss, to show the program’s acceptance in the market. He said the discussions are going well as CSeries has proven with flight tests that it can deliver on its promises. He said route proving has so far shown a 100% dispatch reliability. Selling points are the possibility to deliver the same seat costs as a larger aircraft with lower trip costs, Figure 4. Figure 4. 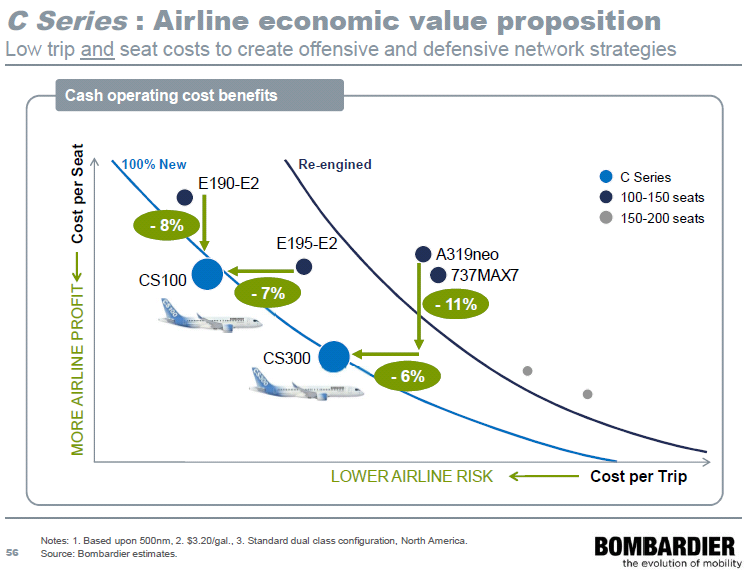 BBD’s view on CSeries trip and seat costs compared to direct competition. 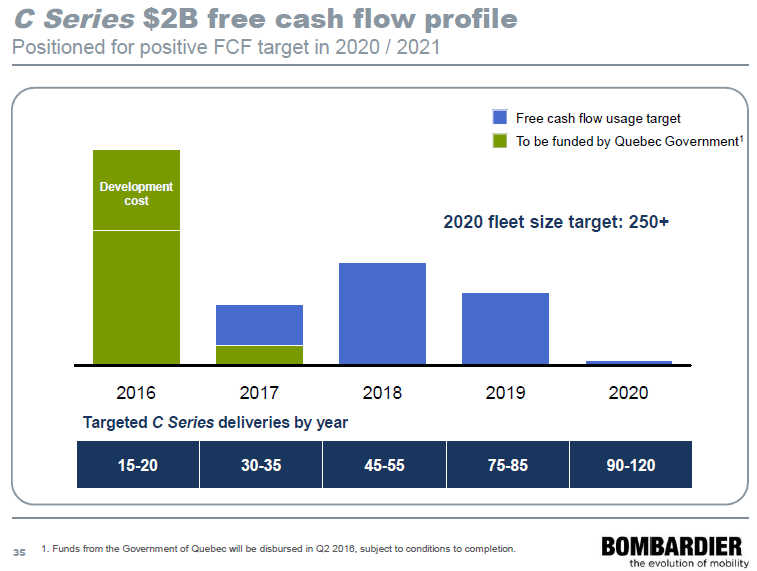 Commercial Aircraft is presently un-profitable, Figure 5, and the initial costs of CSeries production will worsen this until 2020 when the program will be cash positive on a unit basis, Figure 6. Profitability on a yearly basis is planned for 2021. Figure 5. Commercial aircraft’s EBIT bridge back to profitability. Figure 6. CSeries production and cash consumption. Our forecast of CSeries production ramp in our articles “What is the trouble with Bombardier and the CSeries” was surprisingly correct. We also forecasted the production losses per aircraft correctly if one takes into account that we included the engines in our calculations (1/3 of the aircraft value) and Bombardier evidently gets Pratt & Whitney (PW) to deliver the engines at an average program price (PW handle the engine learning curve with their liquidity). As per Figure 5, there is a cost reduction effort required to bring the CRJ and Q400 programs to profitability as well. This will be achieved by changes in how they are manufactured. Overall BBD’s Aerostructures unit wants to concentrate Montreal and Belfast on advanced production like composite empennages and wings and gradually locate simpler Al production to low cost locations like Casablanca, Morocco. 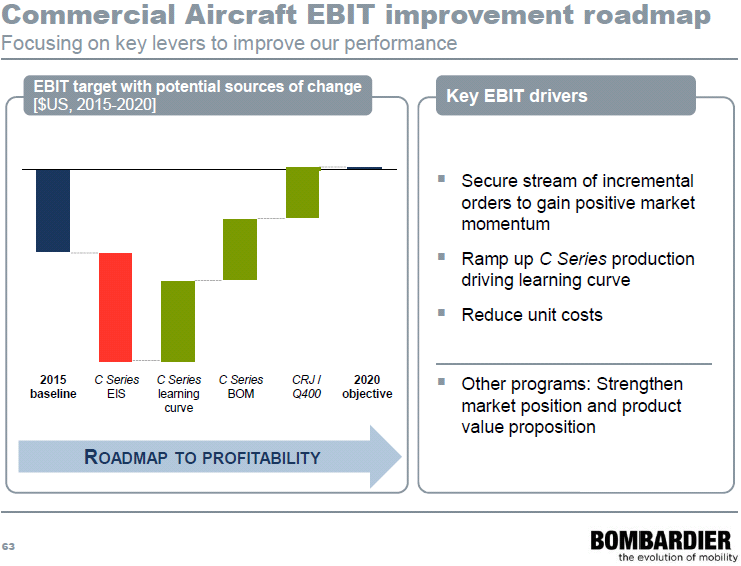 The objective is to achieve break even in the unit by 2020, mainly by cost reduction in existing products and CSeries cost breaking even. It was a regrouped Bombardier that spent a half day trying to convince the investment community that they now have understood their problems, fixed the immediate ones (cancelled non-essential developments like Learjet 85 and fixed the liquidity problem) and that they are now embarking on a transformation program that will bring them in good shape by 2020. The CSeries program is the driver for the crisis but also the dark horse for the future. The aircraft has proven its technical capabilities. It now remains to prove that it is reliable in operational use as well. Should that be achieved, there is a real possibility that it can propel the Commercial aircraft unit to a size and profitability where it can form the third strong leg of Bombardier. I wonder how they obtained that data of average monthly worldwide passengers per departure, from U.S. Department of Transportation…? Per IATA data, load factors are higher than 80% worldwide, in domestic U.S. higher than 84%, and aircraft in the 100-149 seat segment are practically non-existent. – To me, the graphic doesn’t look quite right. You are quite right the graph doesn’t “look” right. Data is framed to be interpreted to suit the desired message. A more accurate graph would show which airlines and which aircraft account for the departures. Key question that BBD doesn’t address: how does the CS300 compete against A320 low ball pricing? Nine months after being appointed President and Chief Executive Officer of Bombardier Inc. Alain Bellemare delivered yesterday his strategy for the next five years. Actually it’s the whole company that appeared to have been in labour recently before finally giving birth to a healthy 6.5 pound* baby, thanks to a life saving epidural steroid injection of cash from the Government of Québec and Caisse de dépôt et placement du Québec (CDPQ). I was not in the room when the baby was delivered but I was able to watch the accouchement in real time on a computer screen in my home office. It was a long session that lasted more than four 4 hours. There were eight surgeons in the room coming one after the other to give their prognostic for the future. They all looked very professional and remarkably upbeat given the circumstances. At times I felt I was drowning in a flurry of surgical details about varions financial metrics they were flashing on the screen one after the other in order to make a positive impression on the various analysts and journalists that were attending, plus all the investors and observers (like me) that were watching. Normally the birth of a new child is supposed to bring joy to everyone, but in this case not for the investors apparently. For after the presentation the stock immediately took an unexpected dive. But after the less emotional analysts produced their initial reports this morning the stock started to climb back up even faster than it had plunged yesterday. I share the enthusiasm of those analysts because I could see for myself yesterday that the chief surgeon and his seven assistants seem to know where they are going. So much so that at times they appeared almost unrealistically optimistic. But wether the plan takes five or seven years before it brings substantial benefits doesn’t really matter, unless you have invested a large chunk of your savings in BBD. Which is unfortunately the case for thousands of people who bet on the success of this remarkable company. As for myself I feel reassured today because tomorrow looks good. But I can understand that the word tomorrow doesn’t necessarily mean the same thing for everyone. The future can actually be defined as the next second, or the coming minute. For others it is next year or the following decade. But in our Millennial world time seems to be compressed more than ever, and we expect everything to happen at the click of a mouse or the trigger of a joystick button. For some individuals, especially the younger generation, it’s hard to understand that this can only happen in computer games or engineering simulations. But what we saw yesterday at the Investor Day in New York was not a game nor a simulation, but a rehearsal. They were practicing the scenario they have put in place for the next five years. Each played his part without faulting and they now look ready to deliver an outstanding performance in the Theatre of Life. I give them a standing ovation. * 6.5 billion CDN dollars.